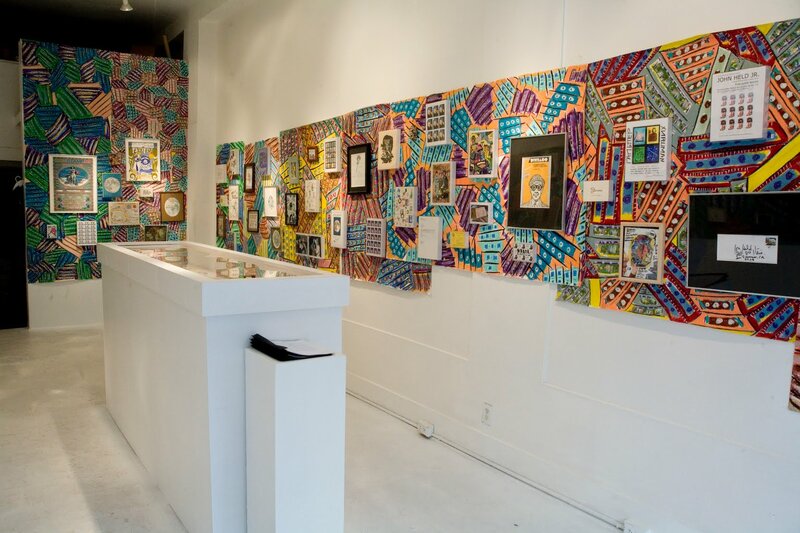 Installation view, Gold Standard at Ever Gold [Projects], San Francisco, 2019. 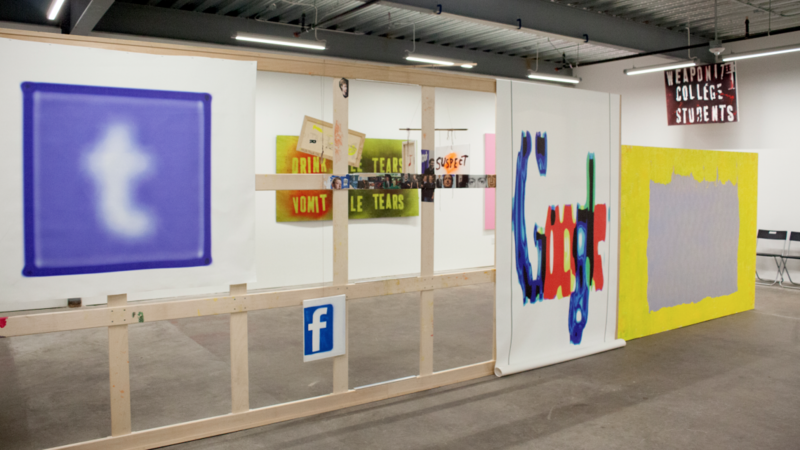 From left to right: Zachary Armstrong, Barry McGee, Korakrit Arunanondchai, and Petra Cortright. 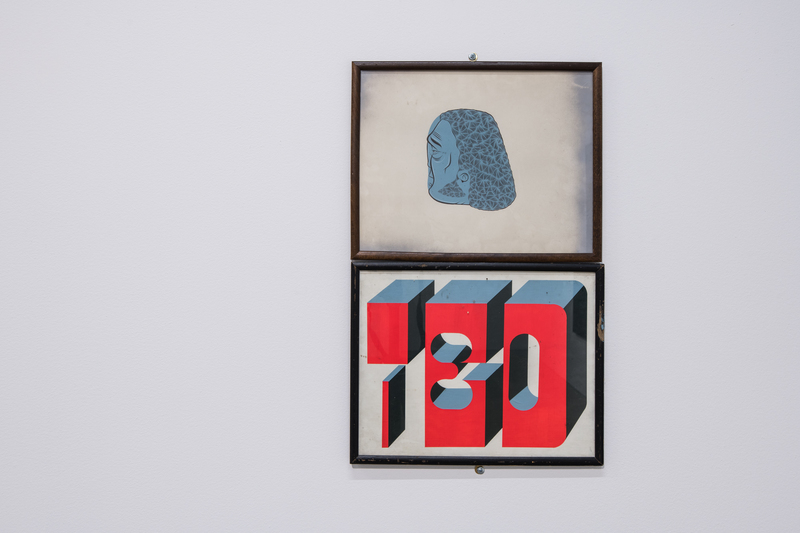 To mark its tenth anniversary, Ever Gold [Projects] presents Gold Standard, an exhibition of works by selected artists currently represented by the gallery as well as a variety of other artists whose work has been instrumental in the evolution of the gallery’s programming. 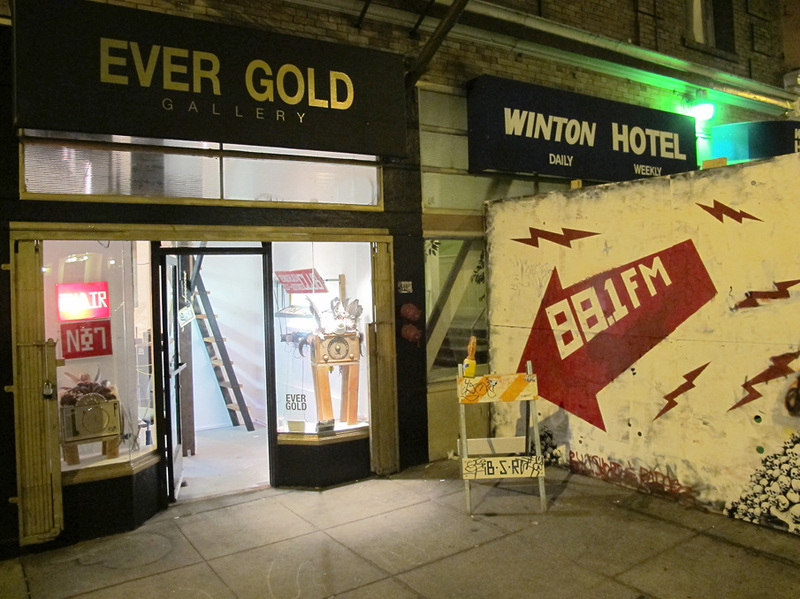 Formerly known as Ever Gold Gallery, it was originally located in San Francisco’s Tenderloin neighborhood in a space previously occupied by a pawn shop/gold teeth fabricator. 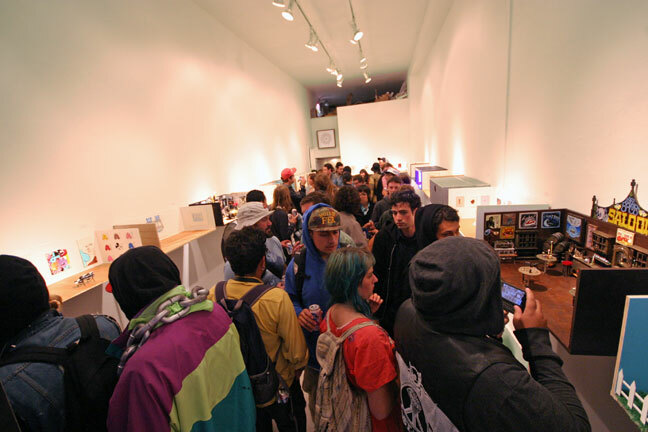 The gallery was run as an artist project space from 2009 through 2015. 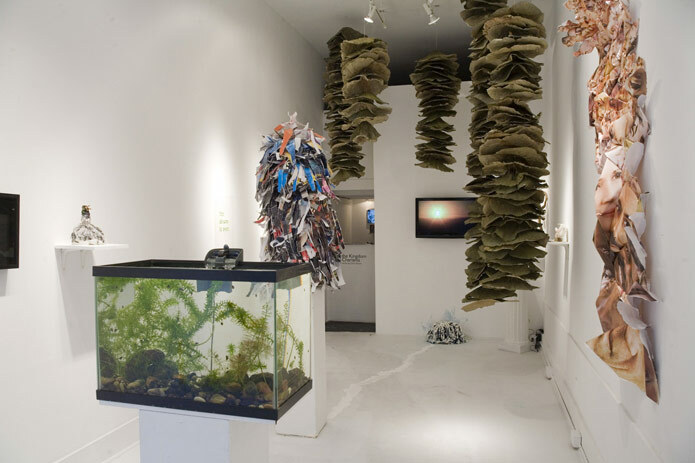 The gallery space—a small, narrow, 400 square-foot space underneath a residential hotel—lent itself to immersive installations and other unconventional forms of exhibitions, performances, and interventions. 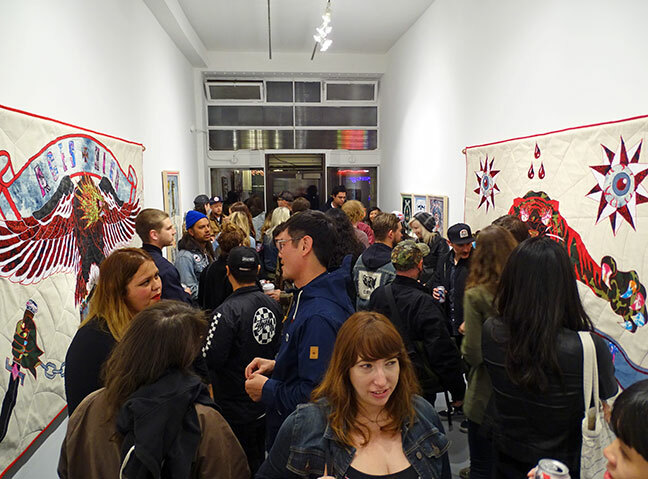 The venue attracted a wide range of emerging artists as well as a number of more established conceptual artists who saw connections between the gallery and the history of alternative cultural spaces in San Francisco. 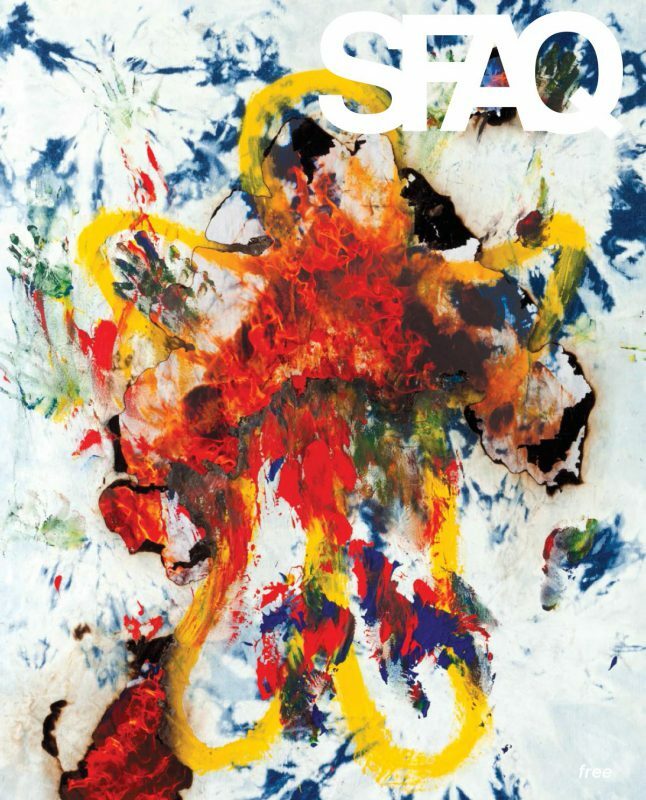 The gallery also served as the headquarters for SFAQ, a free and independent art magazine that produced quarterly print issues from 2010 through 2016. 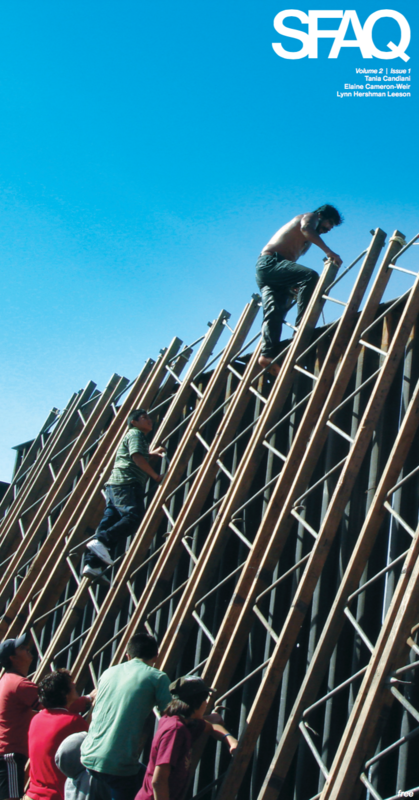 Through SFAQ and its regional counterparts (NYAQ for New York, LXAQ for Los Angeles, and DFAQ for Mexico City), the gallery built relationships with established international artists through interviews and artist projects, including exhibitions, events, and public programs at a second location (2015–2016) called the SFAQ [Project] Space (supported by the Kenneth Rainin Foundation) located a few doors down from the original gallery. 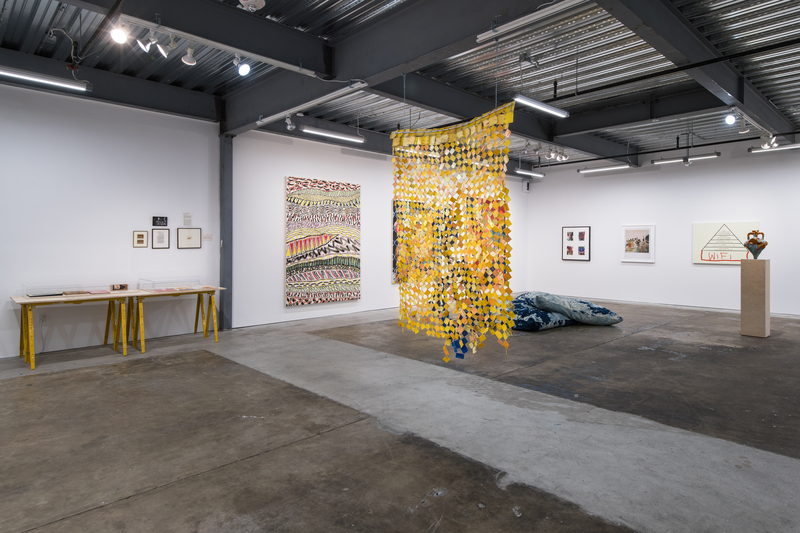 In the spring of 2016, Ever Gold Gallery moved to the Minnesota Street Project arts complex in the Dogpatch neighborhood and was renamed Ever Gold [Projects]. 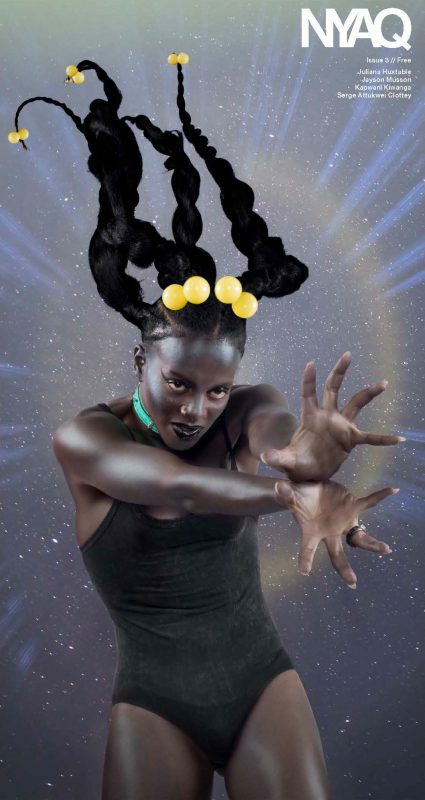 Ever Gold took advantage of the move as an opportunity to pivot and expand its programming. 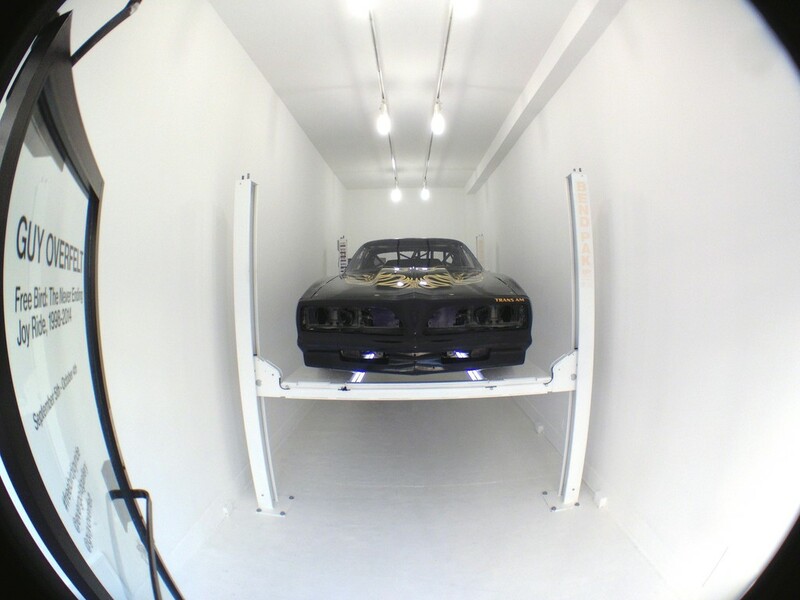 The new space allowed us to further develop existing relationships with a select core group of artists, and to forge relationships with new artists as well—namely, those whose work benefits from or requires the layout of our more traditional white cube layout and over 3,000 square-feet of exhibition space. This new chapter has enabled us to stage more formal exhibitions as well as more ambitious and multi-faceted installations. The artists in Gold Standard can be divided roughly between three categories, though there is some overlap. 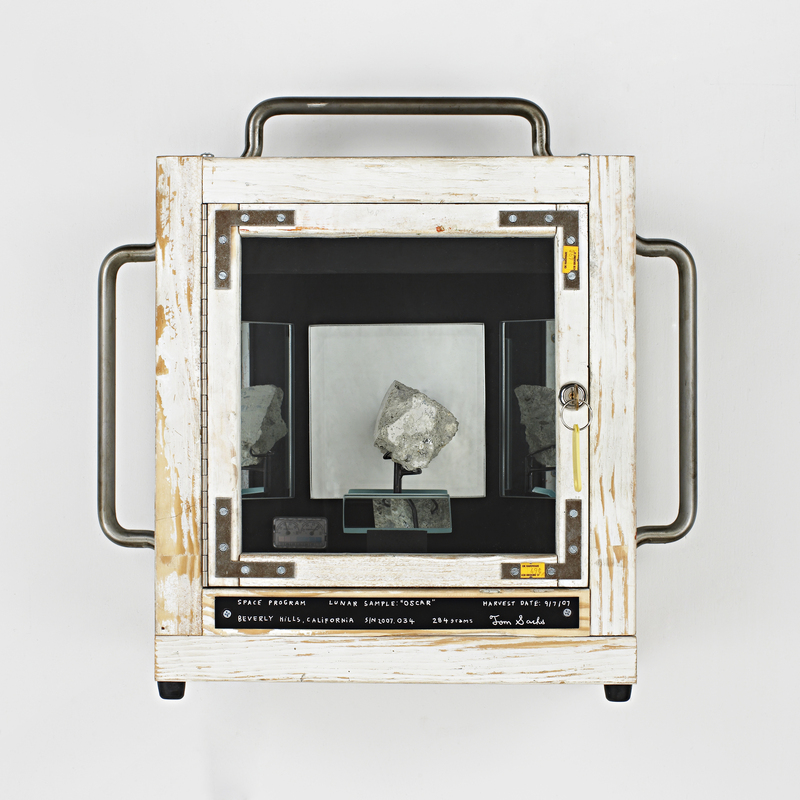 The first group is comprised of artists who began exhibiting with the gallery at the original location: Tom Sachs, Paul Kos, Guy Overfelt, Sadie Barnette, Mario Ayala, Korakrit Arunanondchai, and the Museum of Conceptual Art (curator/director Tom Marioni). 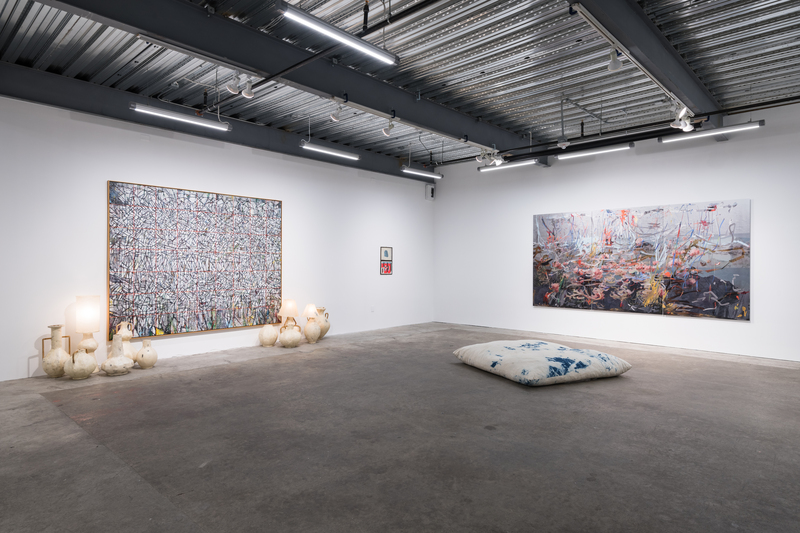 The second is made up of artists who became involved with the gallery through SFAQ: Petra Cortright, Chris Burden, Takis, Barry McGee, Mark Flood, Kour Pour, Cameron Platter, and Serge Attukwei Clottey. 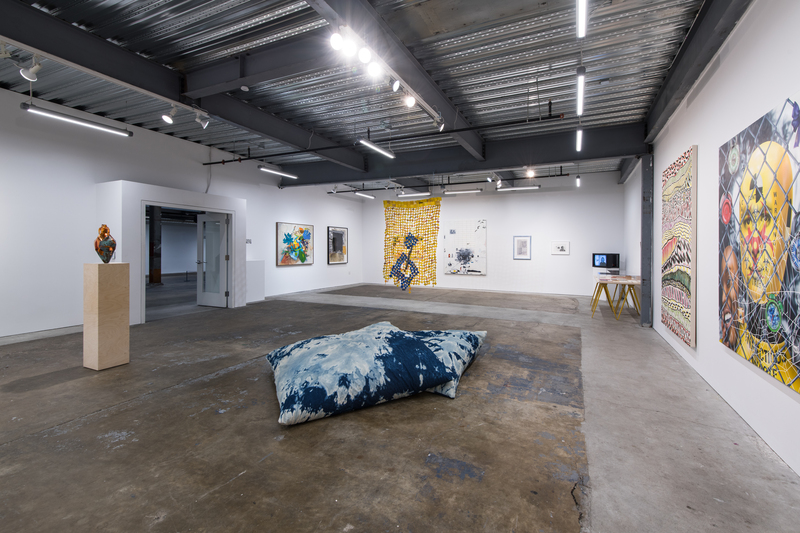 The third includes artists who began exhibiting with Ever Gold at the new Minnesota Street Project location: Christine Wang, Marc Horowitz, Shaina McCoy, Mieke Marple, Sterling Ruby, Zachary Armstrong, Oscar Murillo, Jasmine Little, and Brian Harte. 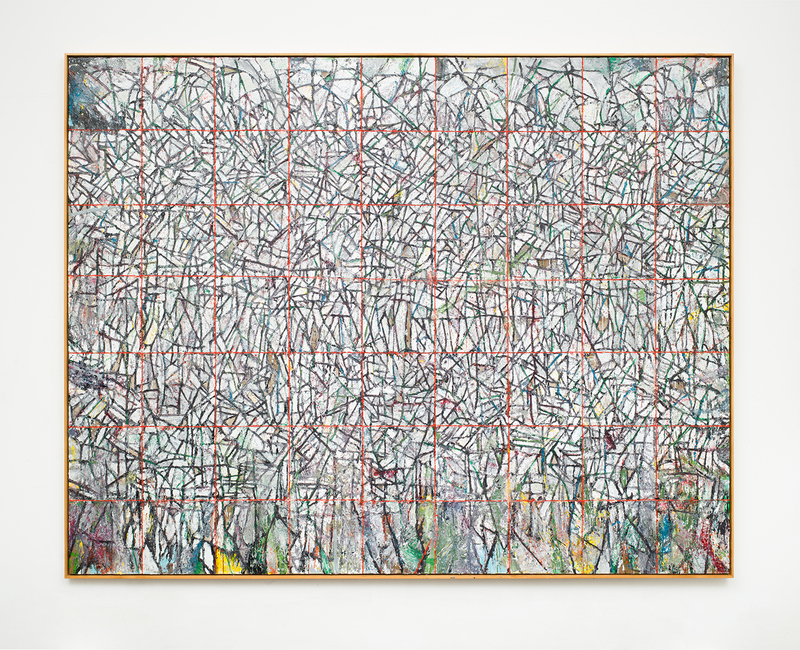 This selection of artists also represents the directions that our programming has developed over time: a general focus on emerging and mid-career American artists, an international focus on emerging art, and an interest in the history of the avant-garde. 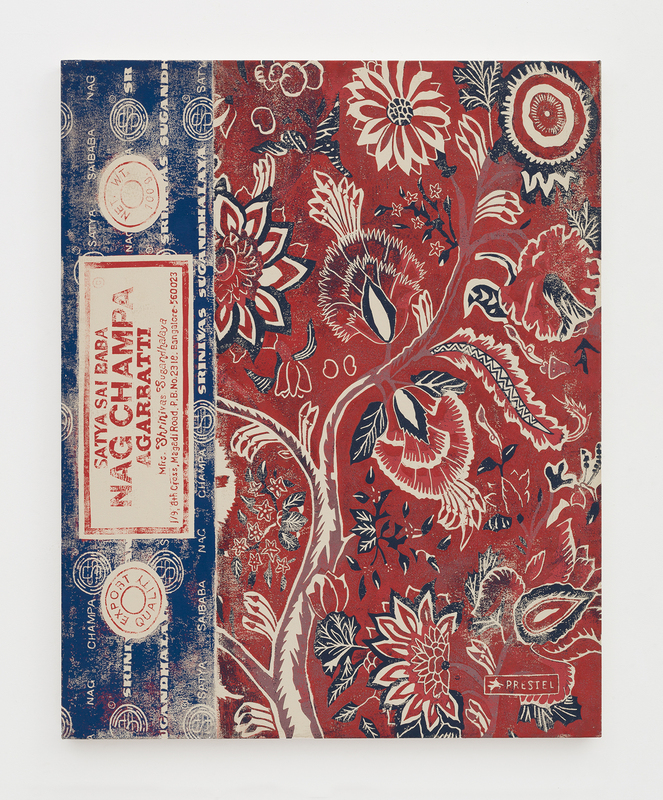 A number of the artists included in Gold Standard will have solo exhibitions at Ever Gold in the coming year, beginning with Kour Pour (March 2 – May 4), and continuing with Christine Wang (May 11 – June 22), Mario Ayala (May 11 – June 22), Shaina McCoy (September/October), Marc Horowitz (November/December), and Mieke Marple (November/December). 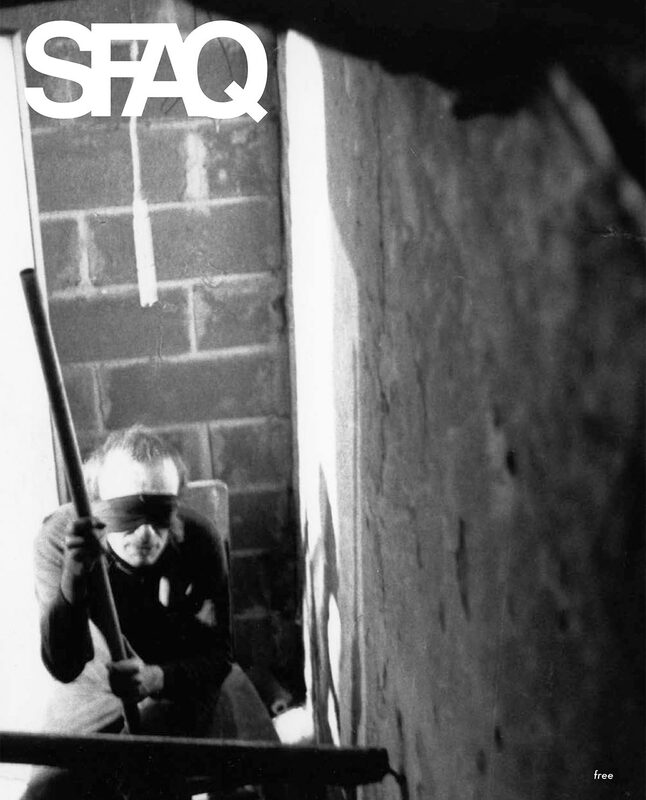 Using the aesthetics of SFAQ, an accompanying catalogue will be released in January and will include a full index of every exhibition (90+) we have presented and every artist (270+) who has shown with us over the last 10 years. We also want to thank every artist, collector, foundation, patron, critic, institution, curator, friend, and performer that has helped make Ever Gold what it is today. 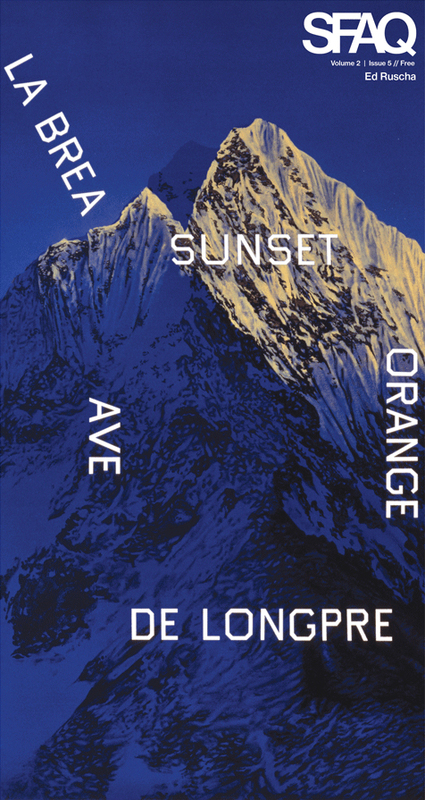 It’s been an exciting and alternative journey—one usually at odds with the status quo of the art world and based in the constantly pivoting ethos and landscape of San Francisco. We look forward to the next 10 years! 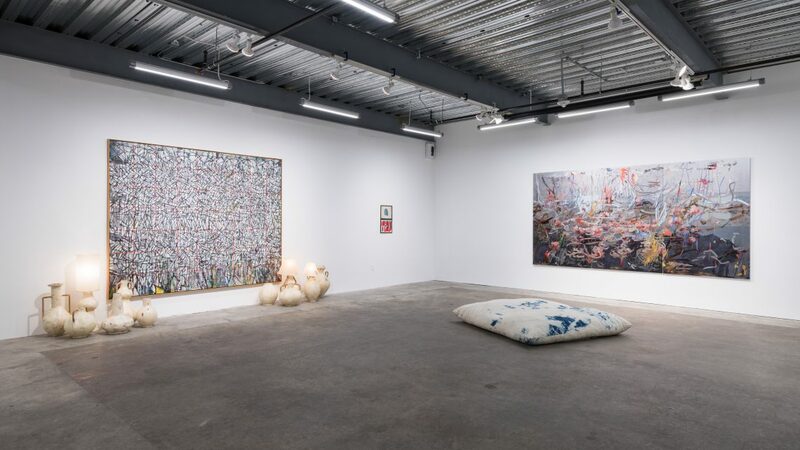 Installation view, painting and sculptures by Zachary Armstrong on view in Gold Standard at Ever Gold [Projects], San Francisco, 2019. 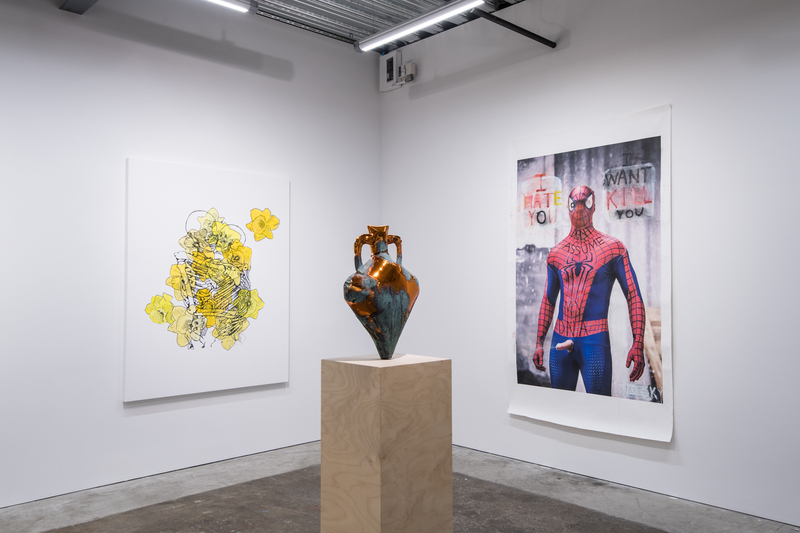 Installation view, sculptures by Zachary Armstrong on view in Gold Standard at Ever Gold [Projects], San Francisco, 2019. Installation view, Gold Standard at Ever Gold [Projects], San Francisco, 2019. 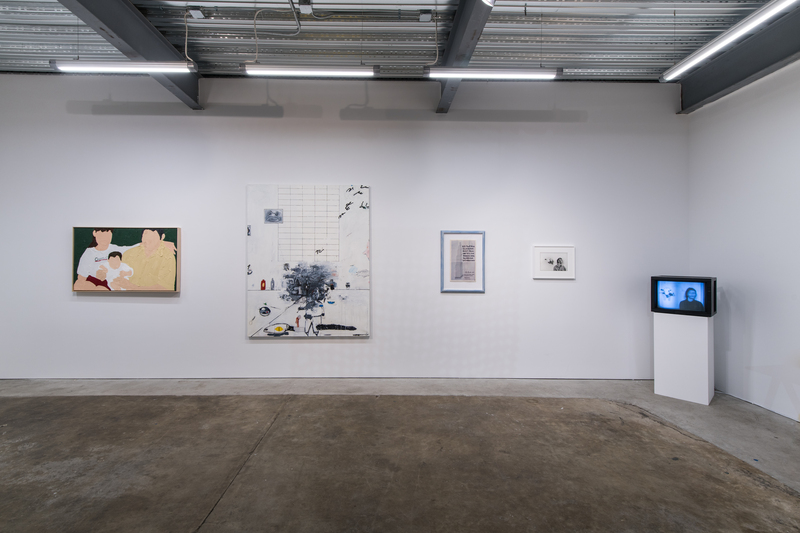 From left to right: Tom Sachs, Ed Ruscha, Zachary Armstrong, and Korakrit Arunanondchai. Installation view, Gold Standard at Ever Gold [Projects], San Francisco, 2019. 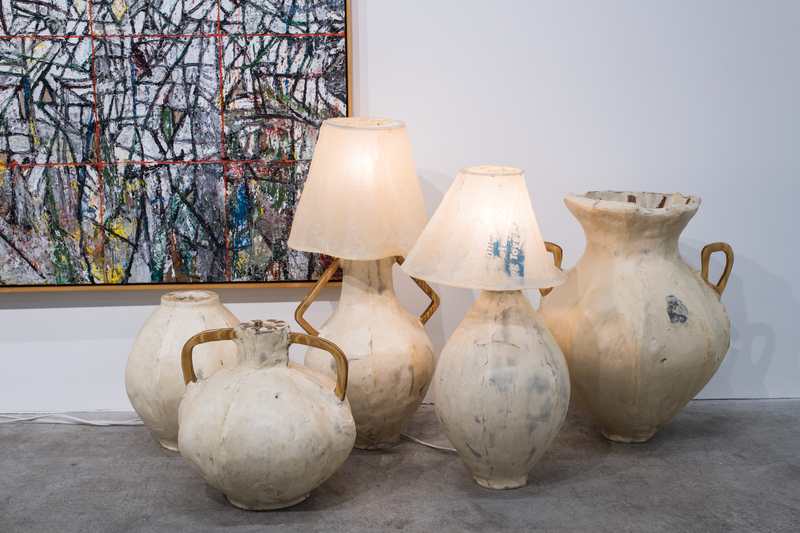 From left to right: Tom Sachs, Kour Pour, and Ed Ruscha. 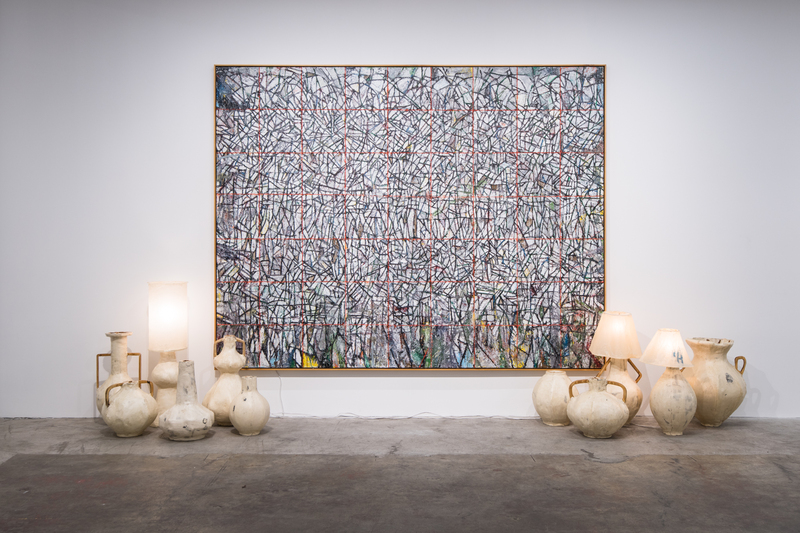 Installation view, painting by Kour Pour on view in Gold Standard at Ever Gold [Projects], San Francisco, 2019. 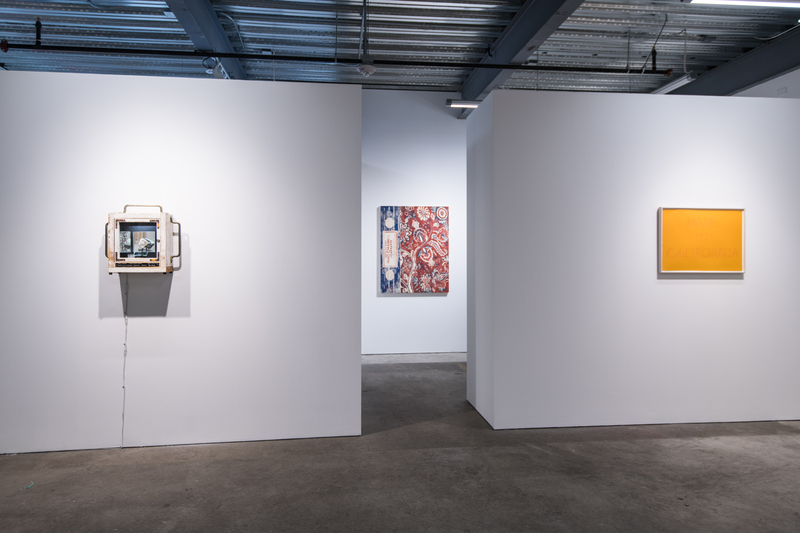 Installation view, work by Takis on view in Gold Standard at Ever Gold [Projects], San Francisco, 2019. 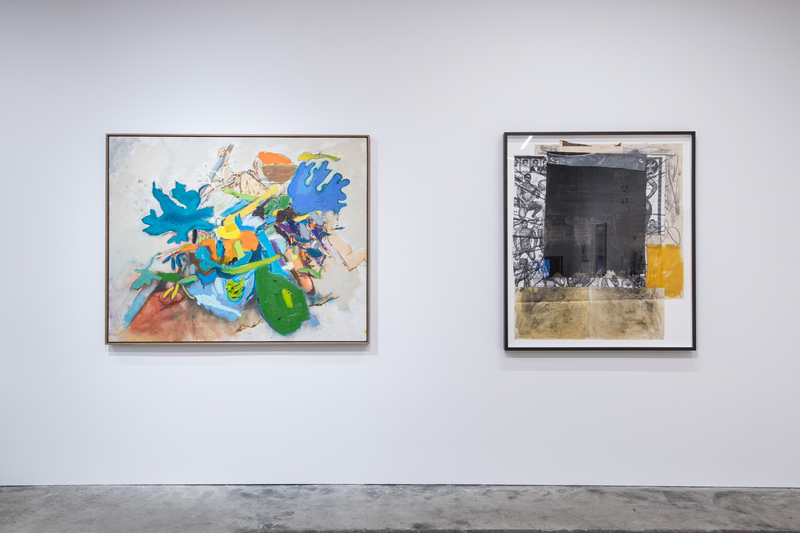 Installation view, works on paper by Frédéric Bruly Bouabré and sculptures by Guy Overfelt on view in Gold Standard at Ever Gold [Projects], San Francisco, 2019. 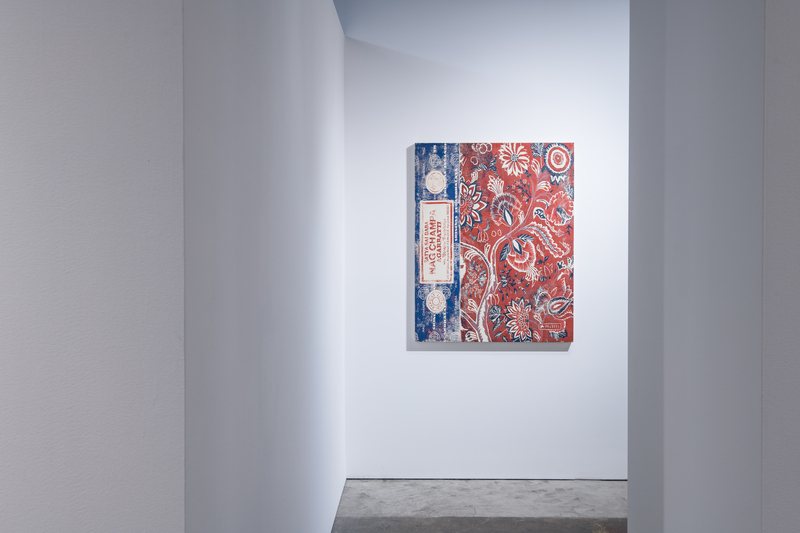 Installation view, Gold Standard at Ever Gold [Projects], San Francisco, 2019. 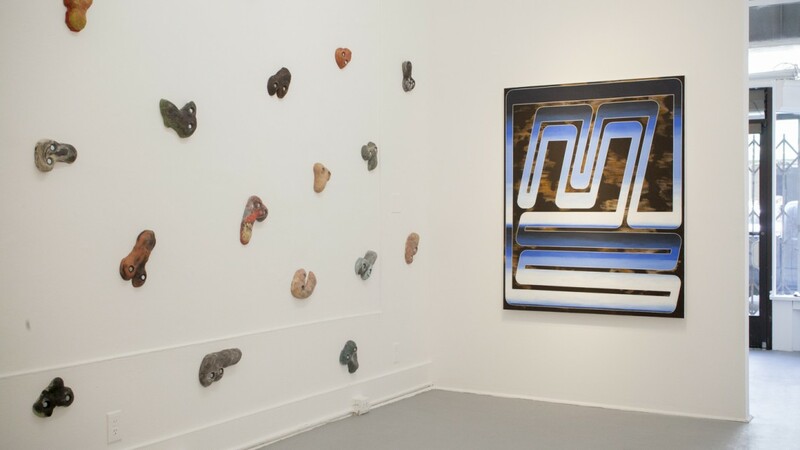 Installation view, Gold Standard at Ever Gold [Projects], San Francisco, 2019. 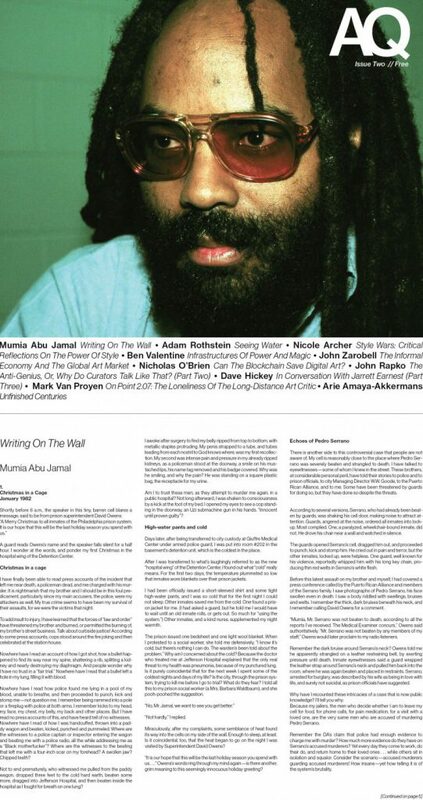 From left to right: Marc Horowitz and Oscar Murillo. Installation view, Gold Standard at Ever Gold [Projects], San Francisco, 2019. From left to right: Shaina McCoy, Brian Harte, Serge Attukwei Clottey, Paul Kos, and MOCA. 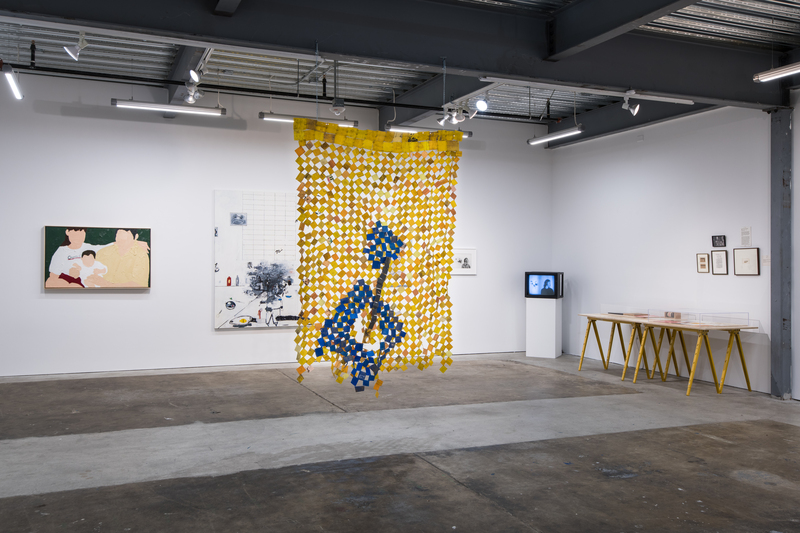 Installation view, Gold Standard at Ever Gold [Projects], San Francisco, 2019. 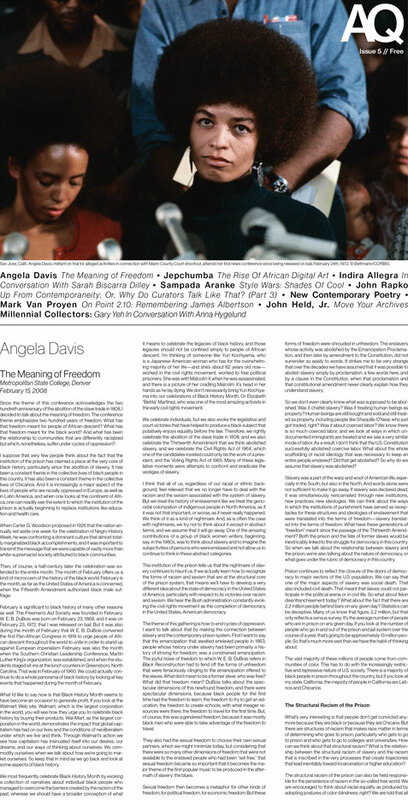 From left to right: Shaina McCoy, Brian Harte, Chris Burden, and Paul Kos. 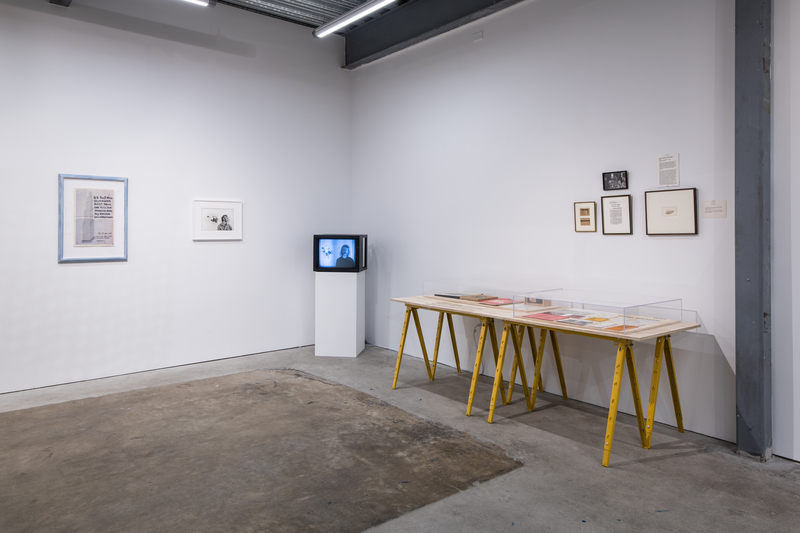 Installation view, selections by Tom Marioni from MOCA and VISION Magazine archives on view in Gold Standard at Ever Gold [Projects], San Francisco, 2019. 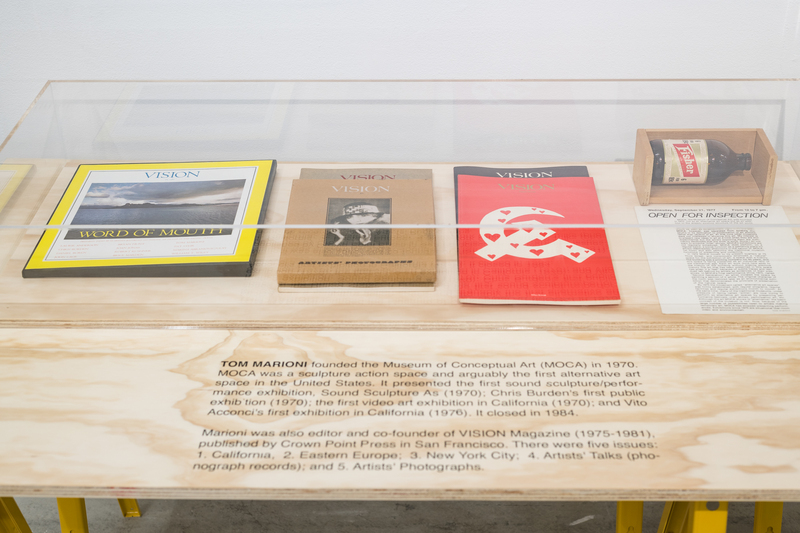 Installation view, selections by Tom Marioni from VISION Magazine archives (detail) on view in Gold Standard at Ever Gold [Projects], San Francisco, 2019. 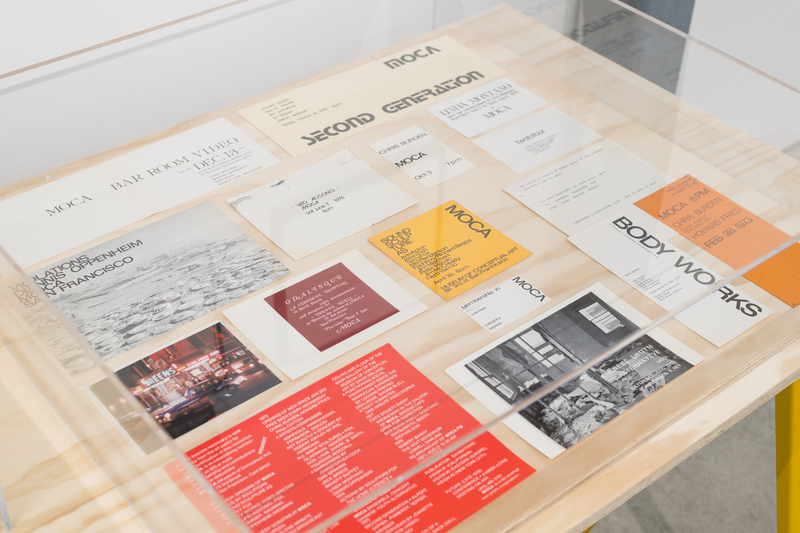 Installation view, selections by Tom Marioni from MOCA archives (detail) on view in Gold Standard at Ever Gold [Projects], San Francisco, 2019. Installation view, Gold Standard at Ever Gold [Projects], San Francisco, 2019. From left to right: Chris Burden, Paul Kos, and MOCA. 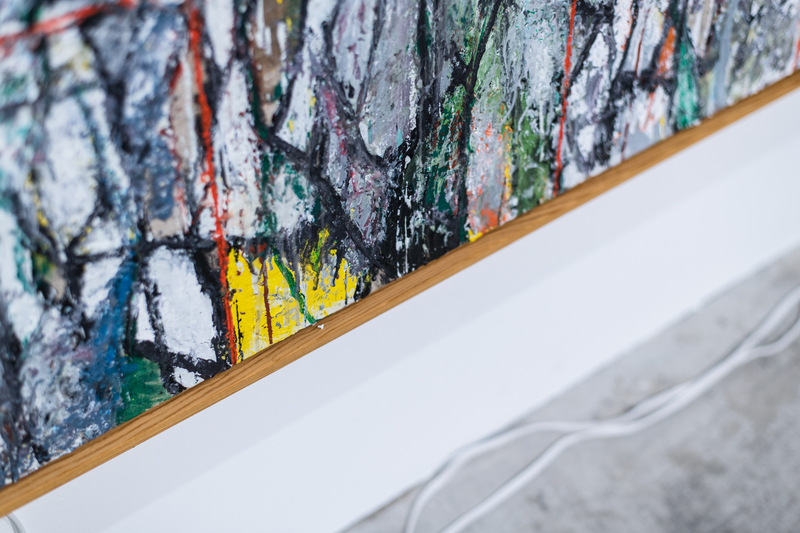 Installation view, Gold Standard at Ever Gold [Projects], San Francisco, 2019. From left to right: Cameron Platter, Mario Ayala, and Jasmine Little. 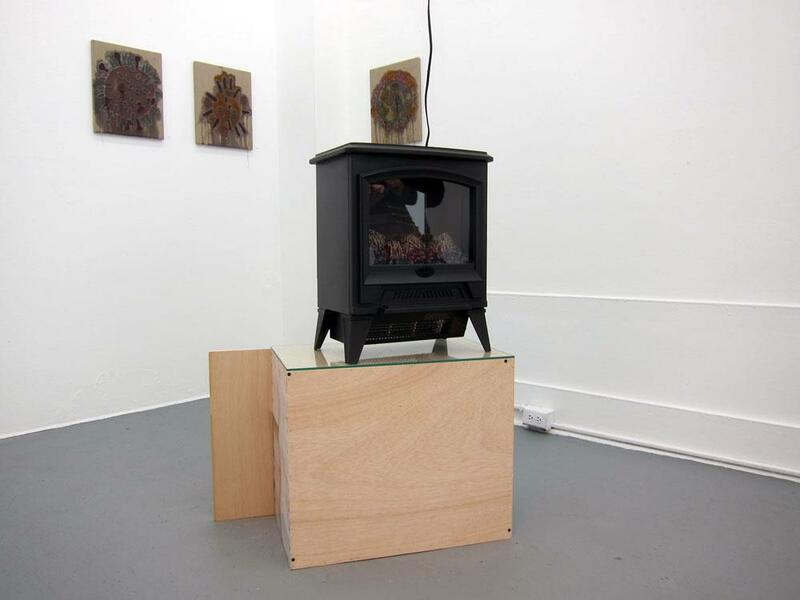 Installation view, Gold Standard at Ever Gold [Projects], San Francisco, 2019. 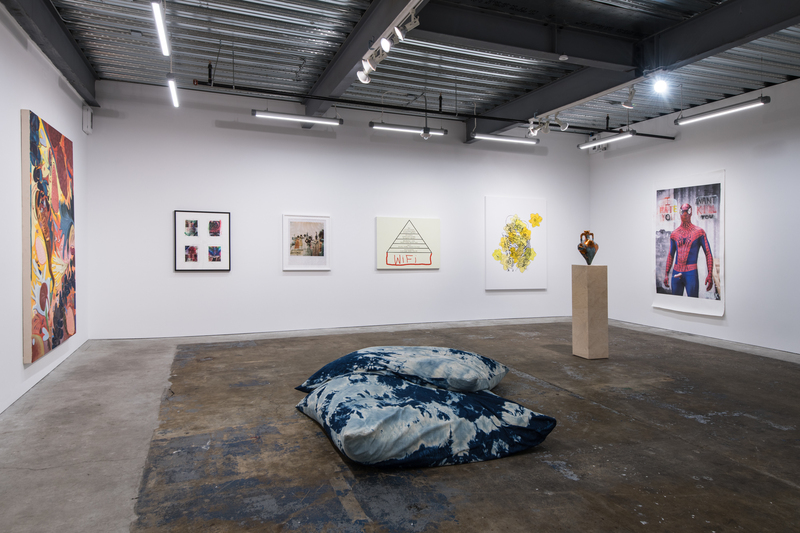 From left to right: Jasmine Little, Sterling Ruby, Sadie Barnette, Christine Wang, Mieke Marple, Adam Parker Smith, and Mark Flood, with sculptures by Korakrit Arunanondchai at center. 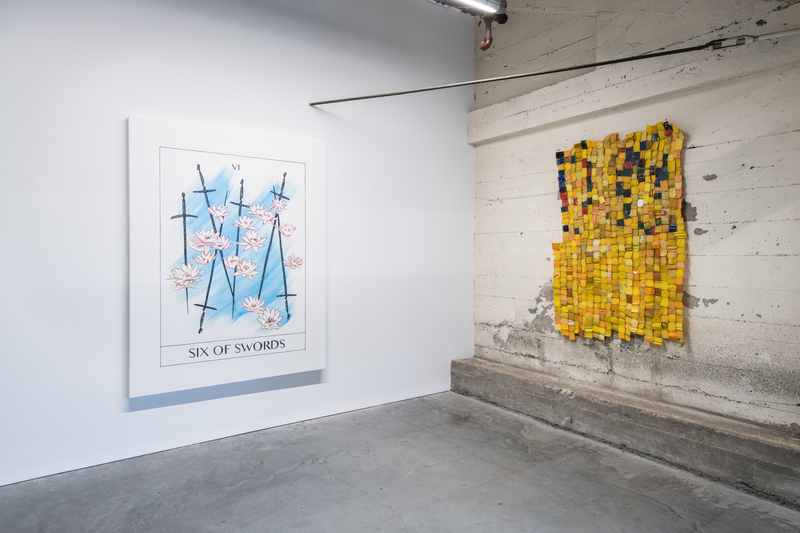 Installation view, Gold Standard at Ever Gold [Projects], San Francisco, 2019. From left to right: Mieke Marple, Adam Parker Smith, and Mark Flood. 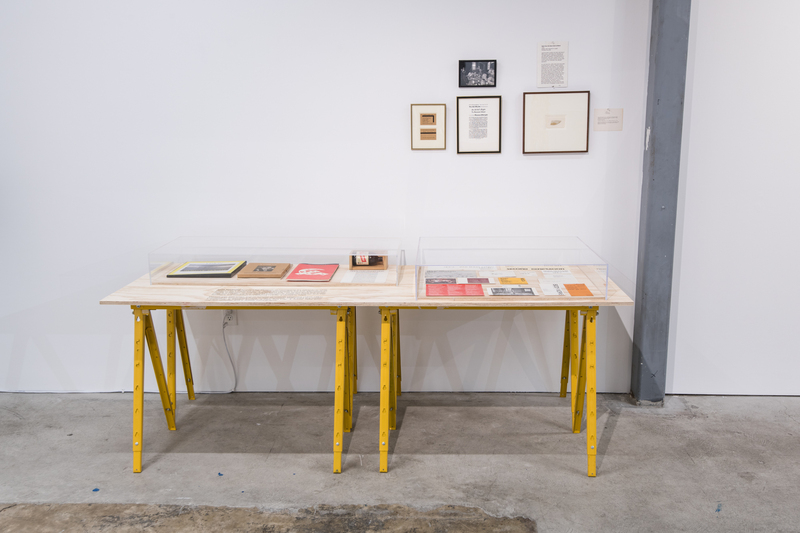 Installation view, Gold Standard at Ever Gold [Projects], San Francisco, 2019. From left to right: Kate Groobey and Mieke Marple. 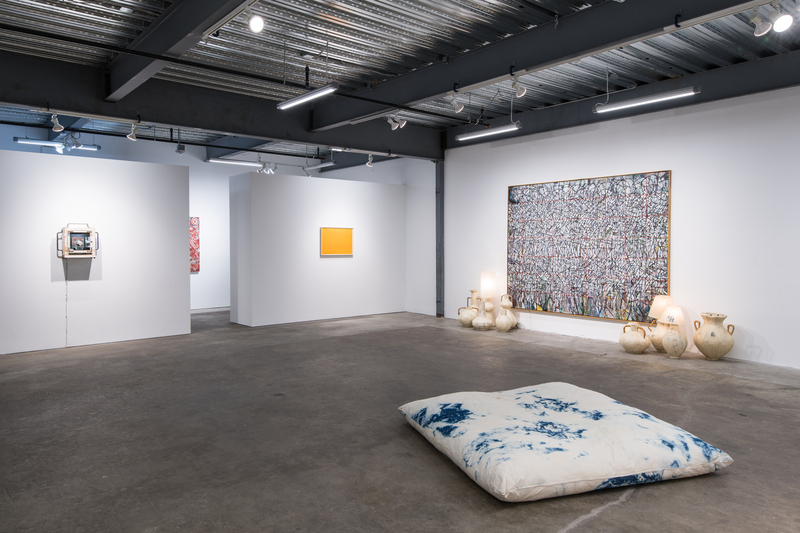 Installation view, Gold Standard at Ever Gold [Projects], San Francisco, 2019. 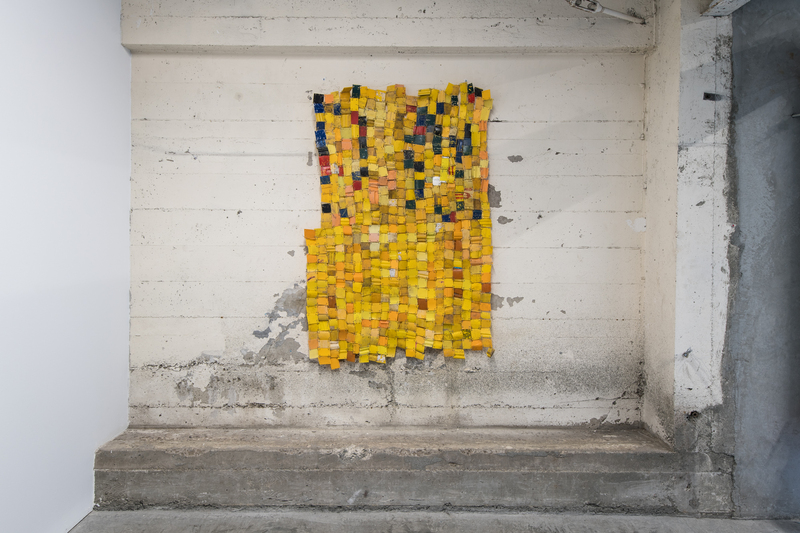 From left to right: Mieke Marple and Serge Attukwei Clottey. 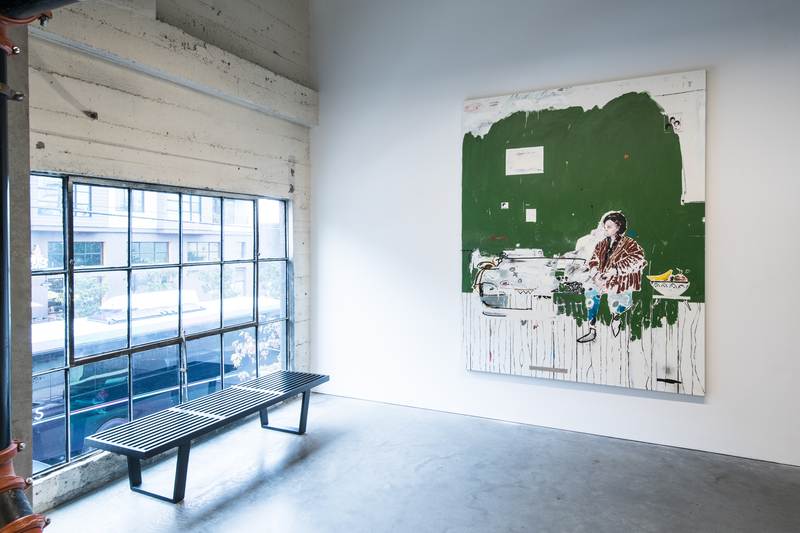 Installation view, painting by Brian Harte on view in Gold Standard at Ever Gold [Projects], San Francisco, 2019. 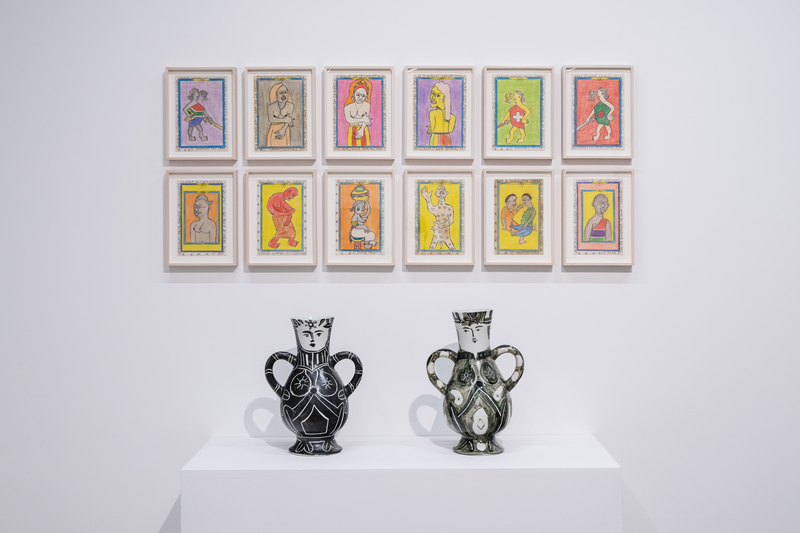 Installation view, A.C.A.B., 1995 – 2017, Guy Overfelt at Ever Gold [Projects], 2017. 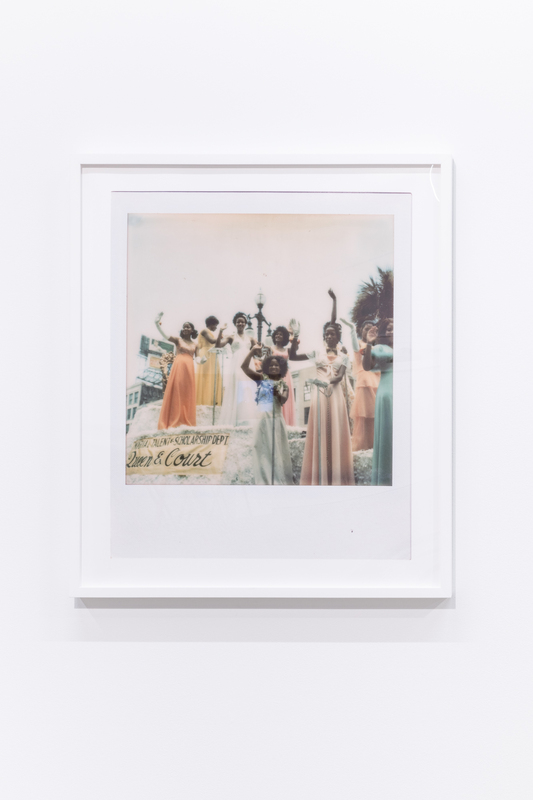 Installation view, SCREAMING HALLELUJAH, Cameron Platter at Ever Gold [Projects], 2017. 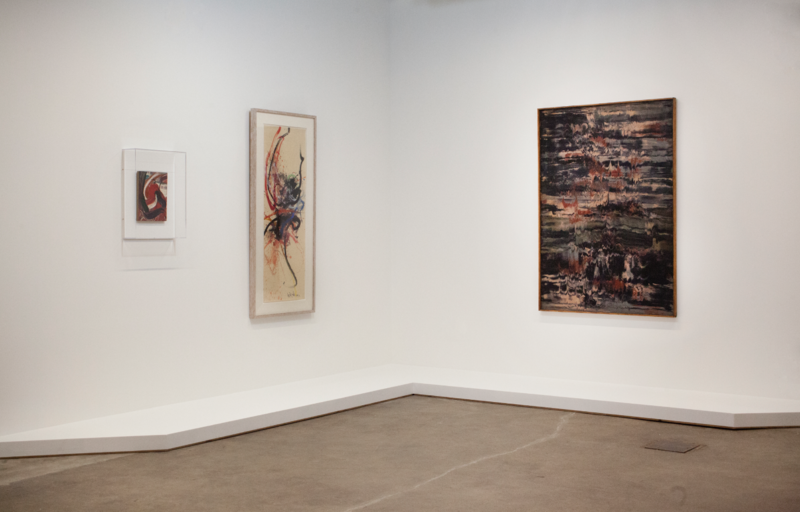 Installation view, Earthquakes And The Mid Winter Burning Sun, Kour Pour and Kazuo Shiraga at Ever Gold [Projects], 2017. 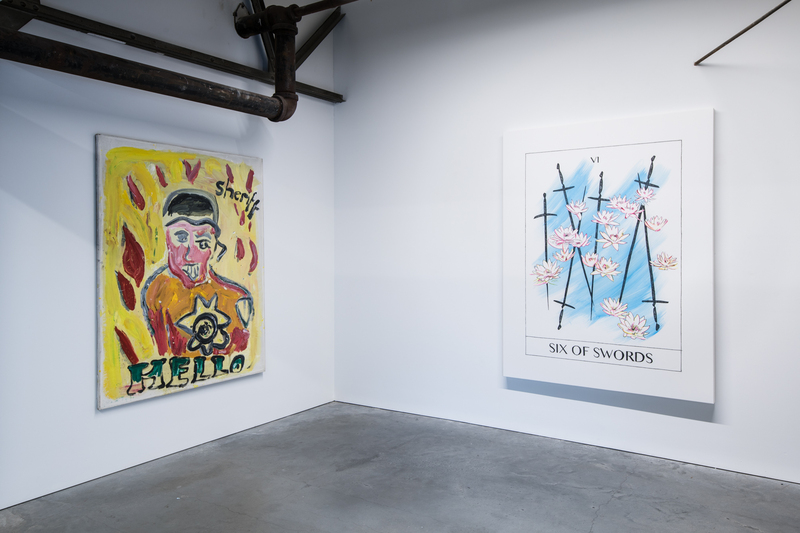 Installation view, Paintings From The War For Social Justice, Mark Flood at Ever Gold [Projects], 2016. 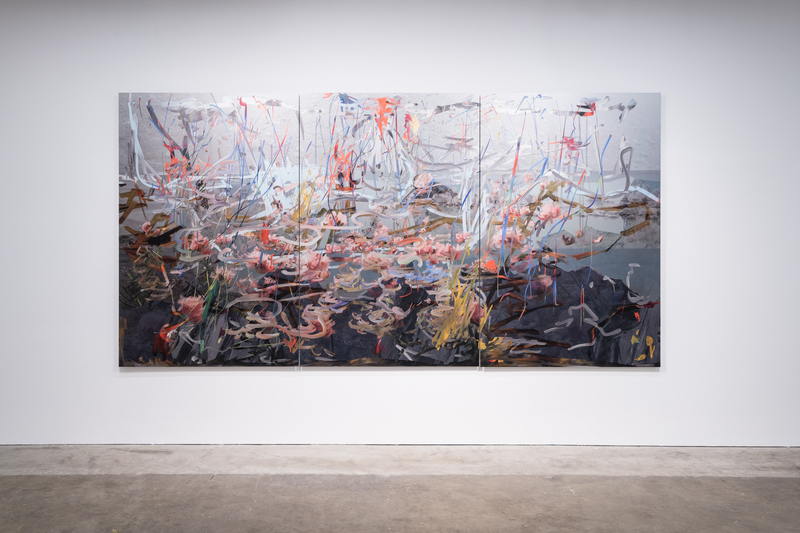 Installation view, Zero-Day Darling, Petra Cortright at Ever Gold [Projects], 2016. 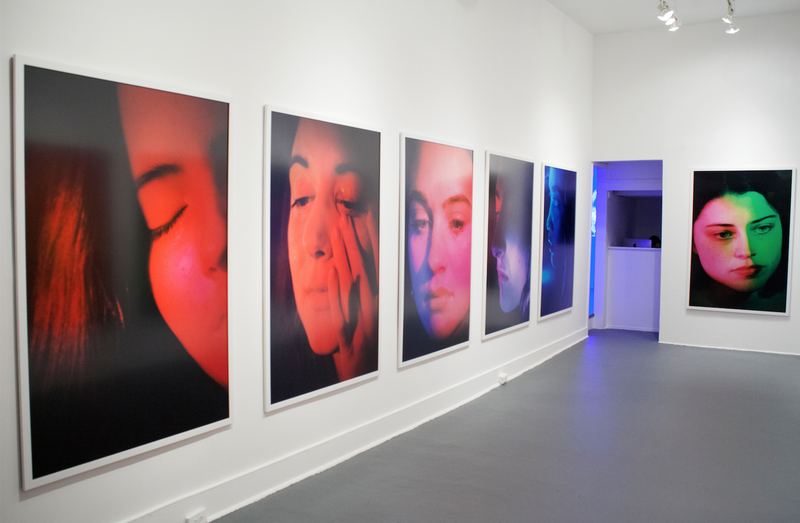 Installation view, 24 Hour Psycho, Petra Collins at Ever Gold [Projects], 2016. 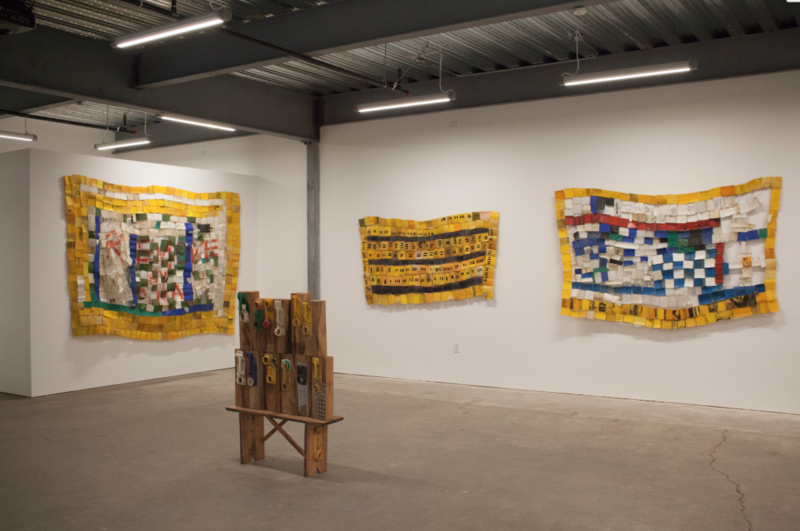 Installation view, Hand to Mouth, Serge Attukwei Clottey at Ever Gold [Projects], 2016. 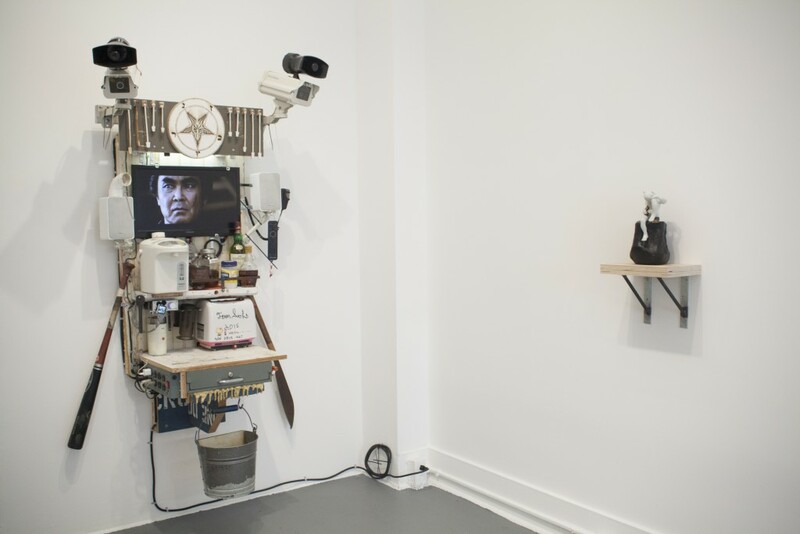 Installation view, Satan Ceramics (Tom Sachs, JJ Peet, Mary Frey, and Pat McCarthy) at Ever Gold Gallery, 2016. 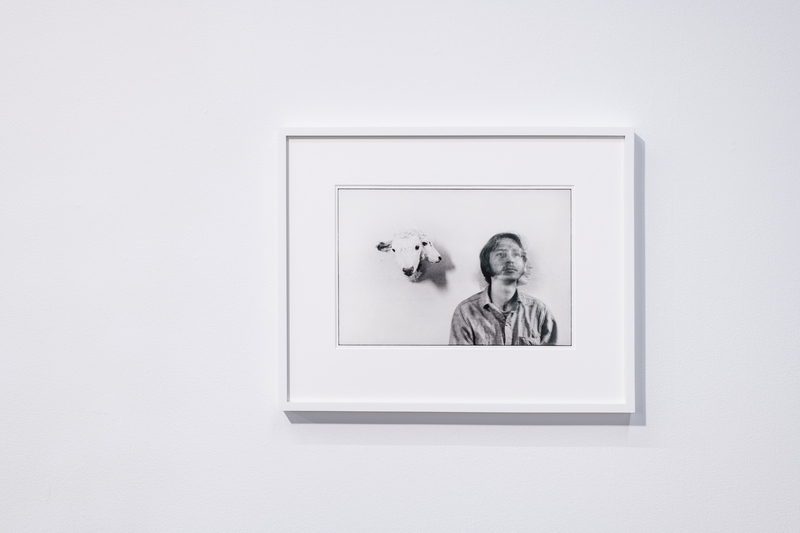 Installation view, Shelters Pat McCarthy) at Ever Gold Gallery & next door at SFAQ [Project] Space, 2015. 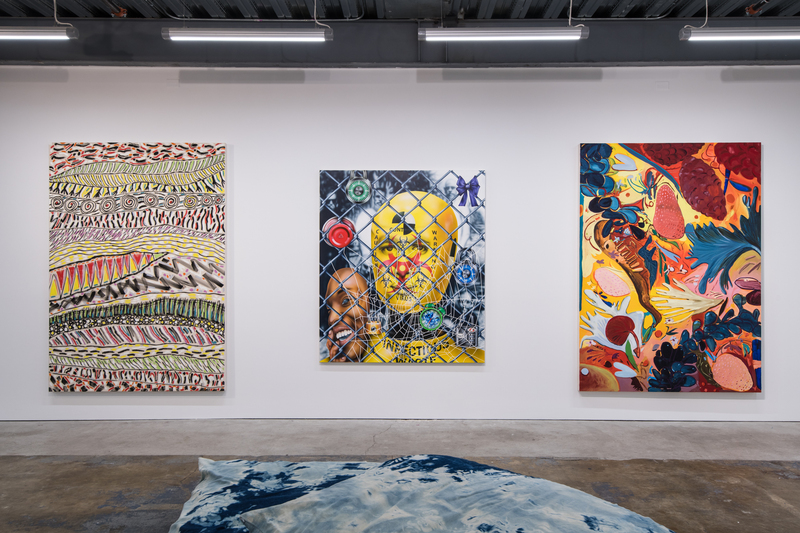 Installation view, Let’s Go All The Way, Ben Venom at Ever Gold [Projects], 2015. 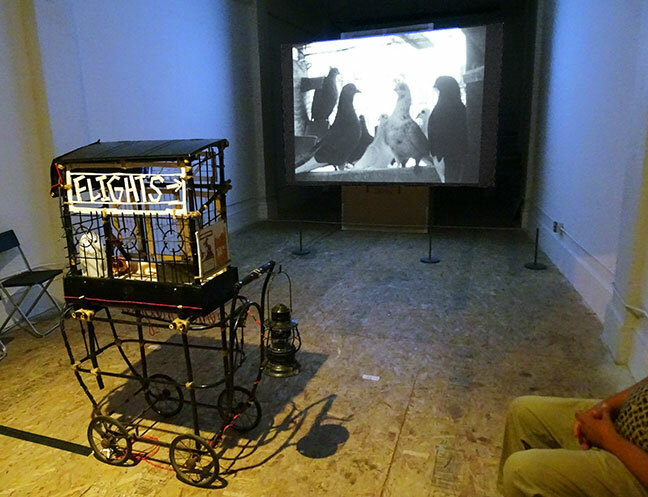 Installation view, Free Bird: The Never Ending Joy Ride, 1998-2014, Guy Overfelt at Ever Gold Gallery, 2014. 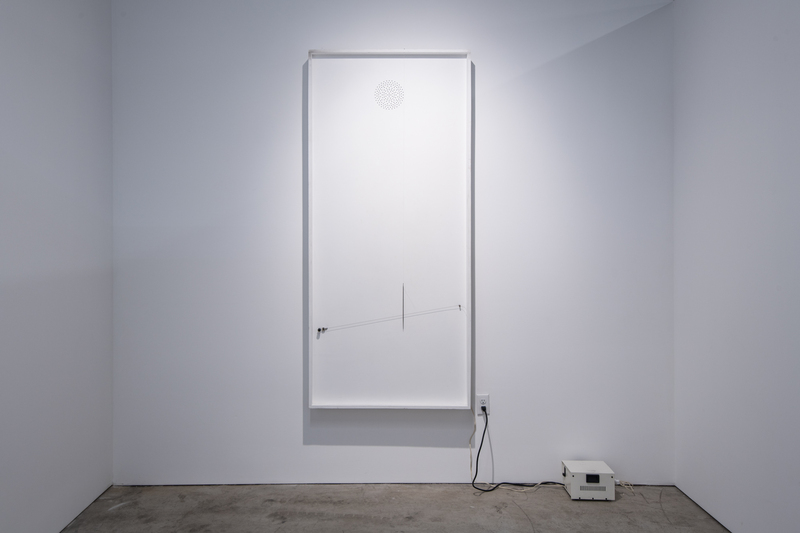 Installation view, +0-000-000-0000, Henry Gunderson at Ever Gold Gallery, 2014. 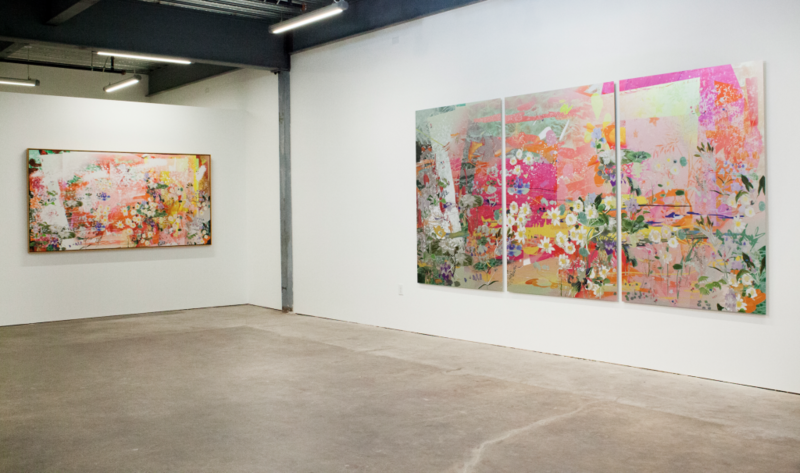 Installation view, A Fertile Menace, Mark Mulroney at Ever Gold Gallery, 2013. 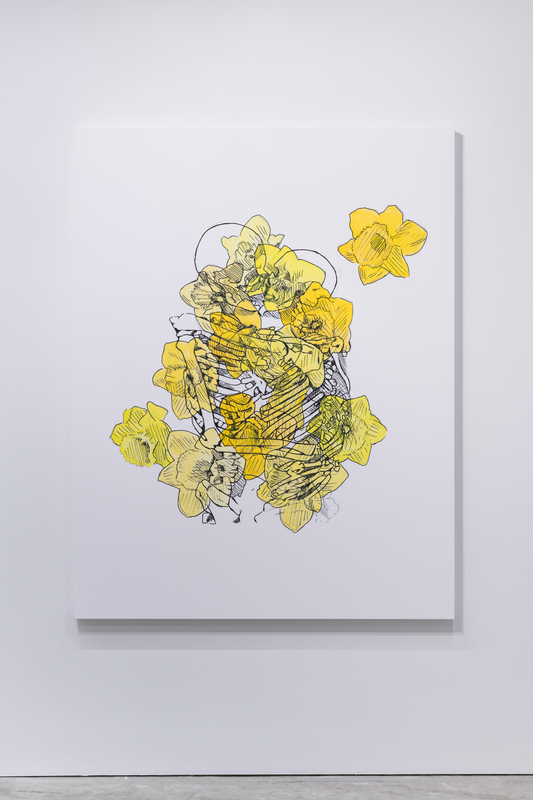 Installation view, Light Farming / Heavy Gardening, Evan Nesbit at Ever Gold Gallery, 2013. 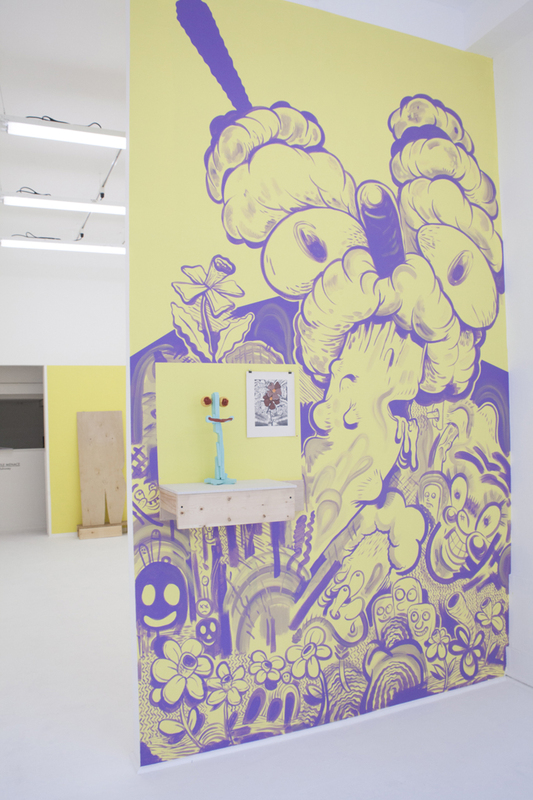 Installation view, Get the Flu, Mark Benson at Ever Gold Gallery, 2012. 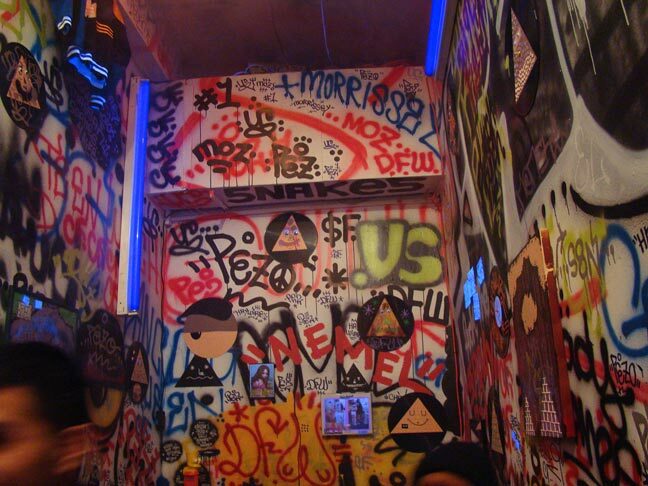 Installation view, Bomb Shelter Radio/Tenderloin Self Defense Club, Josh Short at Ever Gold Gallery, 2012. 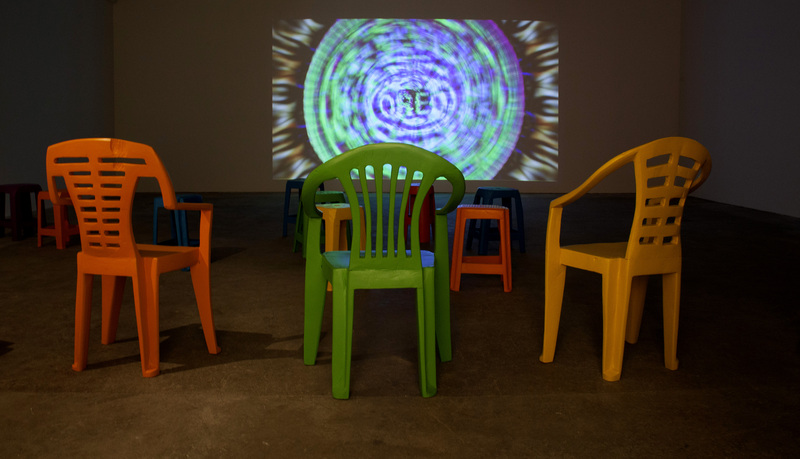 Installation view, Water McBeer at Ever Gold Gallery, 2011. 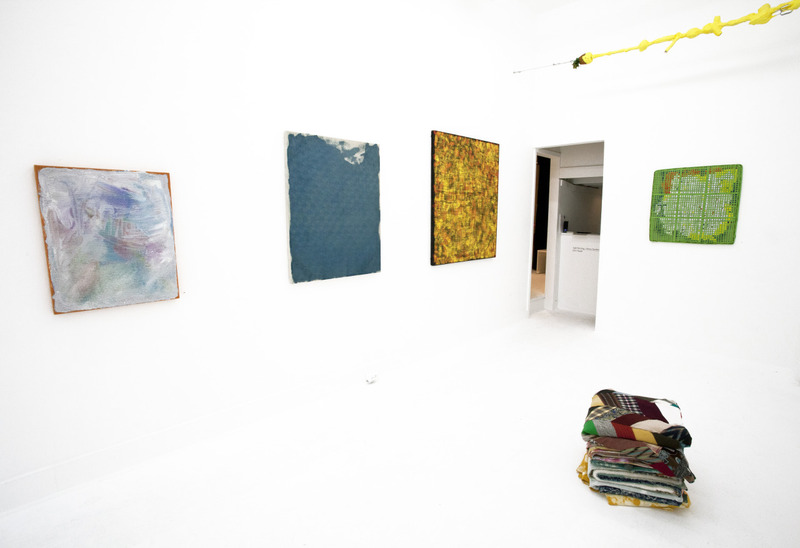 Installation view, EVER WASH, Guy Overfelt at Ever Gold Gallery, 2011. 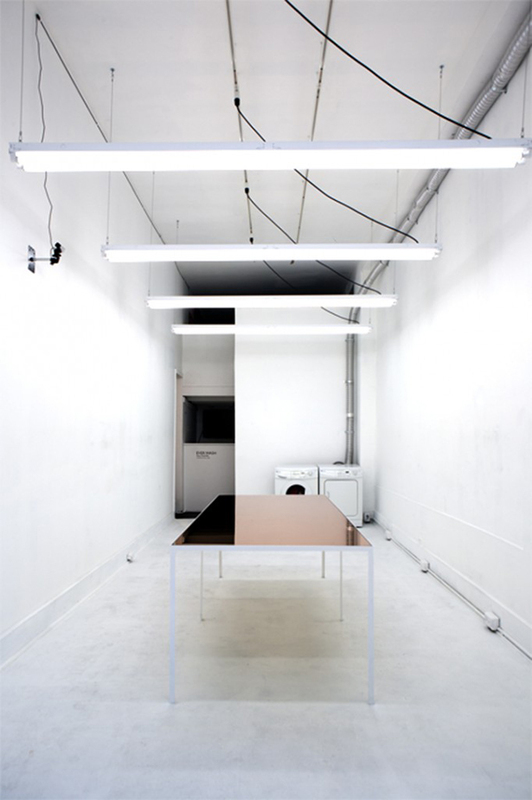 Installation view, In the Kingdom of Charisma, Chris Ritson at Ever Gold Gallery, 2011. 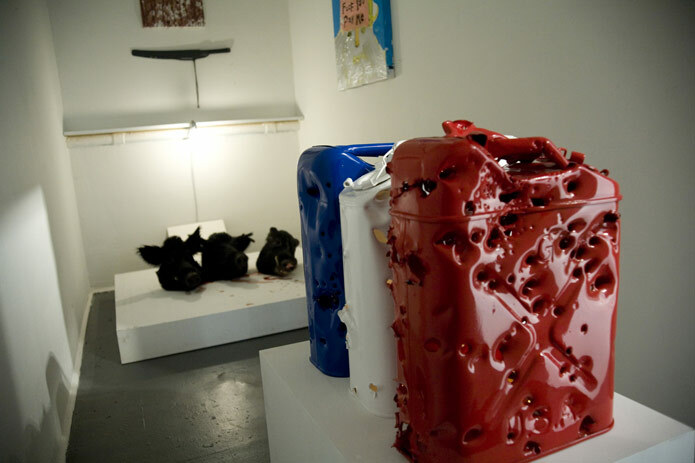 Installation view, Debris from the Cultural Underground, curated by John Held, Jr. at Ever Gold Gallery, 2010. 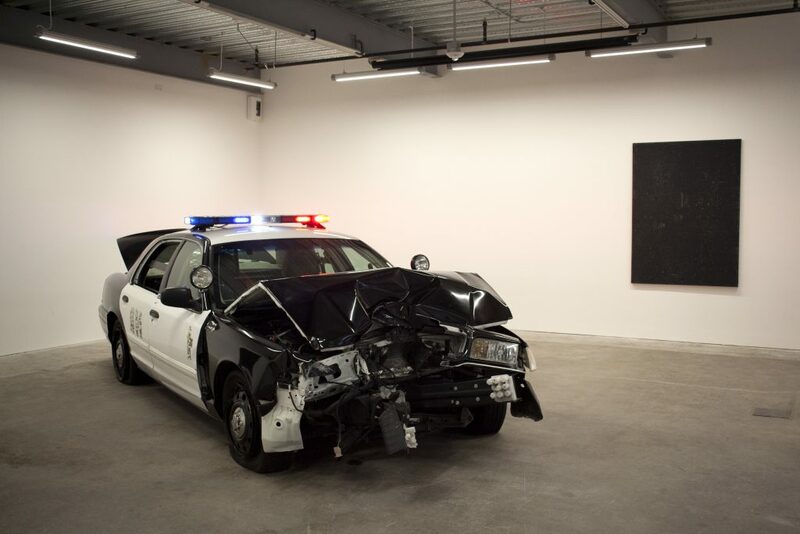 Installation view, Good Cop / Bad Cop, Charles Linder at Ever Gold Gallery, 2010. 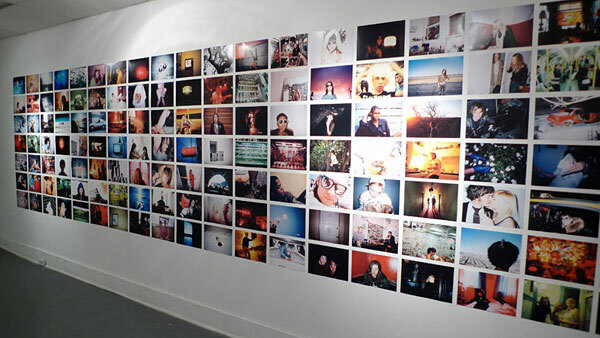 Installation view, Who Needs Friends When You Have a Partner in Crime, Austin McManus and Brandon Chuesy at Ever Gold Gallery, 2010. 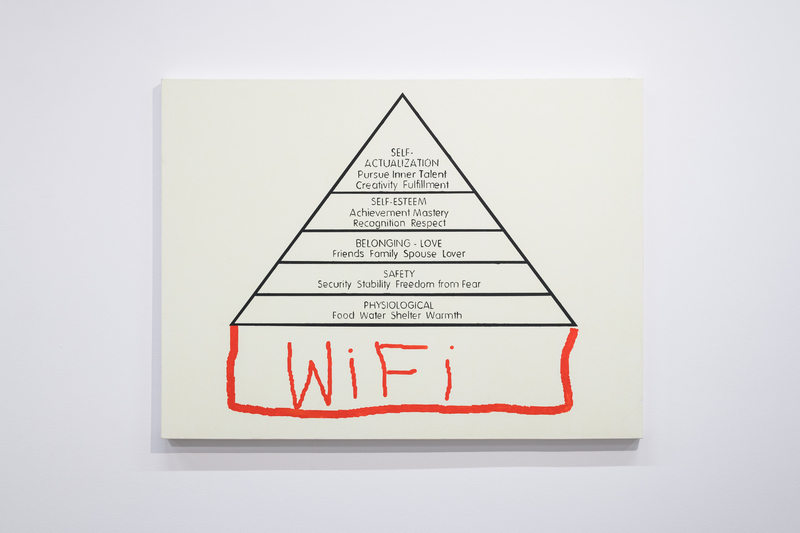 Installation view, Sandy Kim at Ever Gold Gallery, 2010. 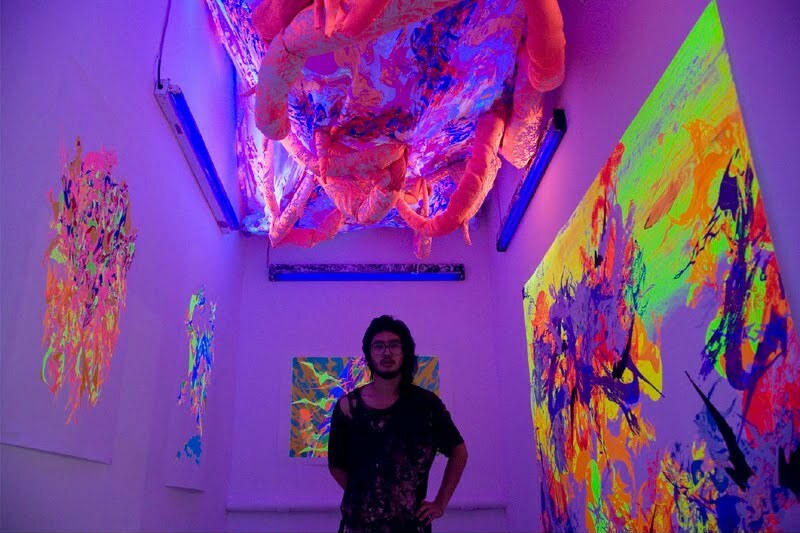 Installation view, WARZ, Korakrit Arunanondchai at Ever Gold Gallery, 2009.